I just realized that I haven’t mentioned this book already here and I think it’s high time I do. 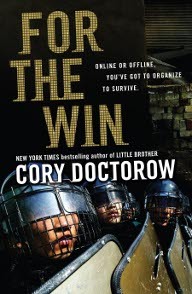 During my recent vacation I went through Cory Doctorow’s latest novel: For The Win and it was immediately a favourite. It’s not often that a book which can extract such strong sentiments out of me but this one did it spades. I kept alternating between anger, excitement, happiness and so on, as I was rooting for the heroes, feeling their pain and being gripped to my seat by the very believable action happening inside. I don’t know if Cory is an anarchist but he seems to have got the practice of anarcho-syndicalism down pat. The only thing that I think would have been improved is if the organizers of the International Workers of the World Wide Web (IWWWW, or Webblies. I kid you not, these were some of the more awesome concepts he came up with) were more decentralized rather than basically being controlled by a few of the heroes and therefore suffering tragic blows when those heroes where directly assaulted. But then again, this is a story and I’m no author so I don’t know how much one can avoid having main actors in the story that one can identify with. Also, while distribution of power is always the optimal way to organize a union, in the real life gritty practice, that can get sidetracked. So in a sense perhaps the book was more realistic this way, while also pointing out the flaws of even a small centralization. On the other hand, it’s obvious how much research and knowledge Cory has invested in learning about gaming and especially MMORPGs and their surrounding Agorism. This is something that might make the novel a bit more difficult to follow for internet/gaming illiterates but on the other hand it will be easier to identify with for a younger audience which has grown into this culture, and perhaps introduce them to the dark underbelly of the beast they’re feeding every month, the dark world around it and the surrounding lives of those who try to make a living out of it. All in all, I can’t recommend this book enough. It’s not written for anarchists in any sense but I can only imagine that anarchists will love it. But I also believe that it will also provide a realistic example of what Anarchist struggle is in practice to all those who prefer to imagine us as either Terrorists or Hippies. Buy it if you can or download it for free if you can’t. Since it’s published in a Copyleft license, you’re free to read and distribute and I hope that, like me, you’ll also choose to talk and write about it. It’s definitely worth it and it’s easily the best book I’ve read in the last 3 years. The Webblies first featured in one of Ken Macleod's books. Can't remember which one though. They had an office in Edinburgh. Very interesting. I didn't know that or the Author. Now I have someone new to check out. Cheers!